If the Halifax band Esme & The Dishrags were given this assignment, they would simply need to hand in their One Big Demo. The trio (Amery Sandford, Jonny May, and Heather Grant) existed for 3 weeks this summer and crafted these 5 original lo-fi pop songs and a cover of Sheryl Crow’s “Soak Up The Sun” for obvious reasons (that song is a jam). The EP’s pop is a combo of punk and doo-wop. Opener “Agave” is a scrappy pop-punk ode to the resilient agave plant in Halifax which bloomed this summer – a rare sight since agave plants only flower once in their 25 year lifecycle. “Bloody Knuckles” is also, appropriately, a scrappy tune with a wobbly guitar line to match the unsteady legs of the victim of the person who has bloody knuckles. 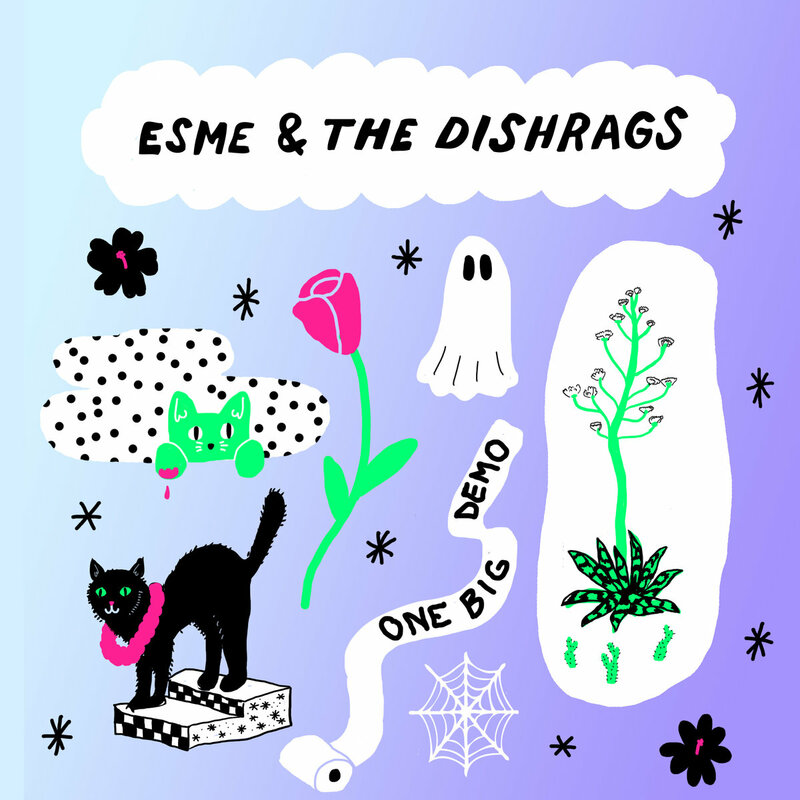 “Esme and Dishrag” is another sweet ode but this time to two cats – you can even hear them meowing at the end of the track. It begins with a slow and tender pace but then the cats run off to play and the tempo speeds up to a playful trot all while the band proclaim their love for their band’s namesake cats. “Unhelpful Angel” starts off with an exchange between Oz and Willow from Buffy The Vampire Slayer because duh, it’s a song about Angel from Buffy. I’m also very happy to say that in my review of The Garrys’ 2017 release Surf Manitou – another warped doo-wop record – I talked about Buffy. Perhaps a new genre classification could come out of this called something like “post-buffy.” As “Unhelpful Angel” progresses, the trio get riled up and roll their eyes at Angel’s (and all those who act similarly) moodiness and mysteriousness that is just downright annoying and unhelpful. Like summer break, Esme and the Dishrags may be over (for now) but their demo will resonate even when the days turn cold.